Last night Gov. David Paterson, Sen. Tom Duane, NYC City Council Speaker Christine Quinn and more showed up to the second protest in two nights, this time at Union Square. 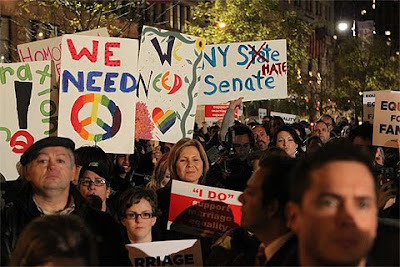 Andy Towle of Towleroad guessed that possibly more than a thousand people showed up to voice their dissatisfaction with New York's senate voting down the marriage bill 24-38. A bill that had passed the Assembly three times. A bill on which eight democratic senators, who have their jobs because of major LGBT support, voted against. Yeah, I'd be protesting, too. 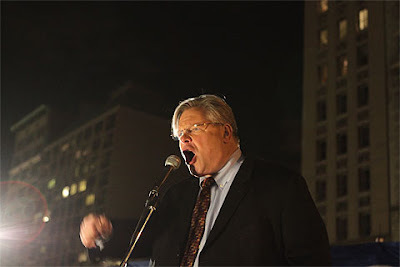 Sen. Tom Duane rightfully gets "angry at the betrayal." Throughout the crowd and from the stage, threats of retribution rained down on the "Hate 38," the Senators that voted against equality. Particular scorn was heaped upon the eight traitorous Democrats, whose faces adorn many placards and who were named and shamed from the microphone. Hearty cheers went up whenever our new heroes like Sen. Ruth Hassell-Thompson were mentioned. 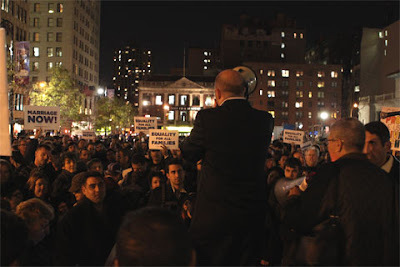 The crowd was instructed about the coming 2010 elections and the NYC seats now in everyone's crosshairs. The evening was definitely not another useless venting of rage, as these things are often characterized. Joe Sudbay takes the topic of retribution and runs with it at AmericaBlog as well as Crain's Insider. Read the New Jersey's Star-Ledger's editorial, "Gay marriage: Equality poses no threat to marriage or religion." ACTION: From Garden State Equality.